Live fuses, shells and landmines scattered in villages around Khundroo Ammunition Depot are haunting a population, who are losing lives and limbs to stray steps, while acres of their arable land remains unusable. Hamidullah Dar visits the villages to find out the torment. Every time Lateef Ahmad Shah, 16, steps out of his house, he looks askance at Brendaanj, a spot among fields near his village Pohloo. Two tears back, a stray step towards this spot had cost him his leg. He had accidentally triggered of a landmine by stepping onto it. Pohloo village is surrounded by 21 Field Ammunition Depot (FAD) at Khundroo from all sides. A 30 feet strip around the depot is planted with landmines. Lateef, on that day, has stepped dangerously close to the ‘prohibited’ area. Lateef says that darkness surrounded him that moment. The next thing Lateef remembers is lying on ground, looking at his “left leg dangling on a pine tree”. “I did not cry for help; I could not. The sound of the blast attracted the attention of villagers who came to pick me up,” Lateef says, tears suffusing his eyes. Lateef is the eldest son of a poor farmer. He walks with a limping gait, so do his hopes. 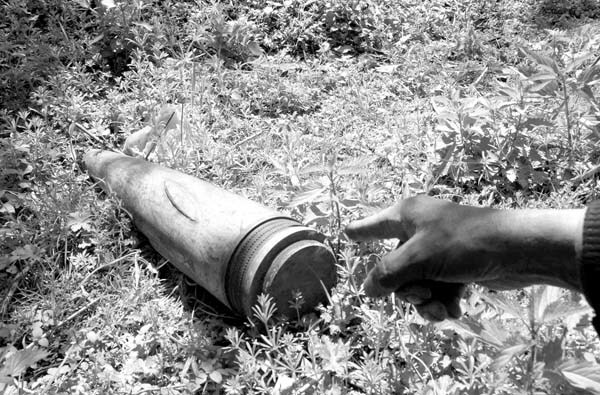 IN 2005, locals say, landmines were planted in a large area surrounding the ammunition depot. Life was never the same again in these villages. 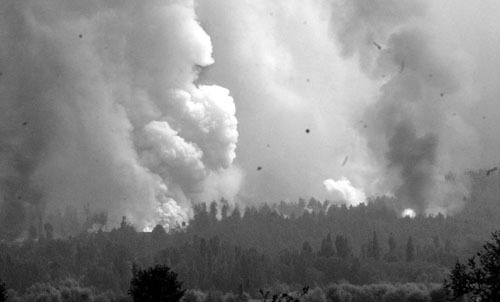 On August 11 in 2007, the whole depot went up in flames with heavy shells flying into the surrounding villages. Officials say 18 people were killed and eight others injured in the blaze, while as thousands of villager had to run for their lives. The explosion affected 13 villages with a population of 26000 spread across 225 square kilometres – Khundroo, Pohloo and Sombran villages being the worst hit. The 61-year-old depot sprawls over five square kilometres and has 25 permanent and 21 temporary sheds. The losses due to the explosions in 2007 cost the army Rs. 1300 crores though ammunition loss was only 10 percent of what 15-corps stocks for war in Kashmir. A minor fire in 2005 in the same depot had killed one soldier and left two labourers injured. The depot stored around 21,891 metric tonnes of a wide variety of ordnance, ranging from missiles and artillery shells to small arms and ammunition. The depot was one among the 40 central and regional ammunition “antiquated ordnance and ammunition depots” of the army that were not upgraded and lacked proper buffer zones and fire lanes safety measures. The incident, villagers say was just an addition to the quagmire of helplessness. While the outcome of the court of enquiry is not known, a general belief is that depot personnel were trying to put things in order for an inspection by the local sub-area commander on August 11 when the fire began from one shed and spread to other ones. Defence ministry gave Rs 26.74 cr for the victims, which instead created its own cycle of haves and have nots. While officials say that smaller shells that were scattered in the area due to explosion of bigger shells have been cleared, a large portion of the artillery remains embedded in the fields and courtyards around these villages, rendering hundreds of acres of land unusable in the Khundroo, Pohloo and Sombran villages. “About 1200 Kanals of land in Pohloo village, used for cultivation of rice has been rendered unusable by shells that sank deep in the paddy fields during the 2007 explosions. Many of our youth had to amputate limbs after accidentally hitting live fuses and bomb shells while working in the fields,” Ghulam Mohammad Bhat, President Auqaf Committee, Pohloo says. His nephew Aijaz Ahmad Bhat is one such victim. Twenty three year old Aijaz had been working in his fields last September when a shell exploded. “I was digging in our fields when my spade struck a live fuse that exploded with a deafening sound. I could not comprehend what had happened in the first place. When I tried to lift my arm, I could not. It was soaked in blood. My left leg was also bleeding profusely. Then I lost consciousness,” says Bhat. Ashiq Hussain Bhat, 20, of the same village also had a similar experience. “We had some guests at our home in October 2008. Everything was going fine. I went out to dig in the courtyard for sowing some seeds. My spade touched a live fuse and it blasted. I regained consciousness to find myself in a hospital with an amputated hand,” he says. The maiming of the inhabitants is not restricted to Pohloo village. Similar tales emanate from Khundoo and Sombran villages. Manzoor Ahmad Mir is the organiser of Auqaf Committee Khundroo. He details the list of people that lost their limbs to landmines. In October 2007, his eight-year-old son Saqib Manzoor lost his hand and had 50 stitches on his abdomen after touching a live shell during dismantling the house that developed cracks during the explosions. Nisar Ahmad Sheikh (25), Abdul Rahman Sheikh (26), and Masarat Jan (20), all residents of Khundroo, have lost one of their limbs to landmines outside the 21 FAD fencing. Haleema (27) of Pingwin lost a feet in a similar incident. At Sombran village, four members of a family became victims of the strewn shells after touching them accidently. “Misra (35) had injured her abdomen, her nephew Zahid Bashir (10) lost right eye and right arm, two minors, Adil Hussain and Bintul Islam were severely wounded when they hit a live shell in October last,” Abdul Hamid, a shop keeper at Sombran informs. Stray shells are not the only danger. Inhabitants of Pohloo have other challenges to face as well. “Troops are exploding the near-expiry heavy Bofors shells at Kaan Nag, just 100 meters away from the village. Explosions take place every 2 or 3 days that shake our already creviced houses, as if an earthquake strikes. We abandon our houses,” said Ghulam Mohammad Bhat. On the slope of a mountain opposite to the blast site, Government Middle School Pohloo is just 300 meters away. The 250 students of this school tremble every time the sound of the explosion reaches their ears. “Earlier they used to blast the expired heavy ammunition at the barren hilly track of Brah hamlet where local population was at a safer distance. Now they (Army) have started to explode them here. It is risking our lives,” Bhat adds. “I get scared,” says Moeen, 10, a student at the school. He says that the blasts remind him of the 2007 explosions. “I want to leave this village,” he says. The people of the area complain that 21 FAD has crippled them socially as well as economically. “There are about 17,000 Kanals of land under this depot. We have been receiving a paltry sum of Rs 600 annually as rent for one Kanal. If the land was with us, we would have made orchards there which would earn us more,” says Abdul Gani Mir, village head Sombran. While the land is under Army’s control or rendered useless by shells, the irrigation canals too have been filled with arsenal. “Bandiwanni Koal (a canal) that irrigated our fields is filled with live fuses and shells. Army has not removed them. We even approached Deputy Commissioner Islamabad, but he told us to clean it on our own,” Mir added. Confirming the report, Station House Officer Achabal Feroz Ahmad told Kashmir Life, that police deputes bomb disposal squads whenever villagers report that a live shell was spotted. “The explosions rocked the area for more than 50 hours. So the presence of stray shells can not be ruled out. But we are continuously monitoring the situation and help whenever complaint is made,” says Ahmad. The aftermath of the 2007 incident has also deprived the people of drinking water as springs are drying up. “Ziyarat Nag (a spring) satiated the needs of this area. It dried up after the 2007 explosions in the depot and we are left with grave water scarcity,” says Haji Abdul Salam Mir, president Auqaf Committee Sombran. People in Khundroo, Pohloo and Sombran villages allege that after the onset of armed struggle in Kashmir in 1990, the area has turned into a landmine zone. “Hundreds of cattle have been killed after straying into the mined area that surrounds the depot. Our grazing land has been snatched on one pretext or other by the troops threatening dire consequences in case we protest,” Mohammad Yousuf Mir (50), a shop keeper at Sombran says. The government also left the inhabitants fuming. They allege that the compensation amount was not disbursed in total. “On the eve of prime minister’s visit to Khundroo last year, former chief minister Ghulam Nabi Azad declared that Rs. 3.5 crore is still lying with the government that has not been distributed among the victims of Khundroo tragedy,” Manzoor Ahmad Mir of Khundroo said.